The Hotel Mazarin, formerly known as the Saint Louis Hotel, has a wonderful courtyard that is well-suited for French Quarter weddings. Spacious and beautiful, it also has the benefit of a retractable canopy to keep bad weather out when needed, a huge reassurance for brides who fear rain on their wedding day. Unlike most tents that are set up for outdoor events, the Hotel Mazarin's canopy is quite high (the lowest portions only come down to the top of the second floor). As a result, it does not adversely affect the ambiance of the courtyard or make it feel like a confined space. In most cases, you won't even notice it unless you look up, and even then the trees in the courtyard can still make the canopy hard to see. There's no better rain plan than one that does not require you to change anything about your wedding ceremony! The canopy also is sometimes used on the occasional particularly cold day to help retain warmth. And more importantly, during the Summer, the canopy combined with air conditioning make the courtyard surprisingly cool even on the hottest days, and there are very few places in New Orleans where you can have what truly has the look and feel of an outdoor wedding on a hot afternoon in such comfort. Wedding receptions at Hotel Mazarin used to also usually held in this courtyard. However, after the hotel's extensive renovation several year ago, including a beautiful indoor space called La Louisiane, receptions are typically held inside now, with the occasional exception of events that will not be going late into the night and that have relatively quiet music, which can still take place in the courtyard if desired. 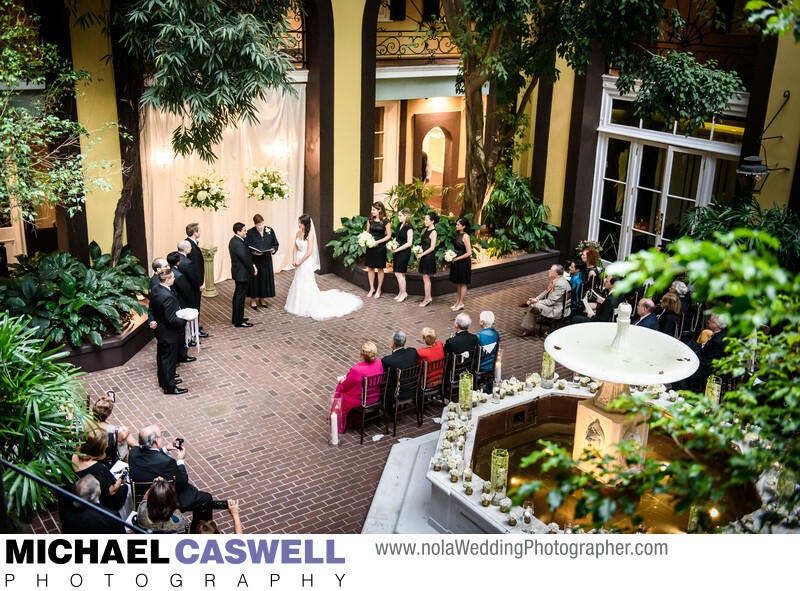 Hotel Mazarin is a great location for a French Quarter courtyard wedding! This amazing New York couple's wedding was coordinated by Brittani Adams of Unique Weddings in New Orleans, and was filmed by Studio Vieux Carre. Meade Wenzel did the gorgeous flowers, and Flawless Bride did their usual amazing job with the girls' makeup and hair. We began with a first look at the Bevolo Light showroom and workshop, where the nice folks graciously let us shoot in the courtyard. As the gorgeous bride walked through the showroom with the beautiful lights trailing along the wall, the groom was waiting in the courtyard. After the first look, we captured some portraits of the couple in Exchange Place, and then headed back to Hotel Mazarin. After the ceremony, a cocktail hour was held in the courtyard, and then a brass band joined musicians Tanya and Dorise for a unique performance of Hava Nagila for the couple's hora, which was festive and chaotic as usual! We then hit the streets of the French Quarter for a second line parade, ending up back at the Hotel Mazarin for the reception. The reception was held in the hotel's indoor space, La Louisianne, where the fabulous party band The Mixed Nuts provided the entertainment. You can usually tell how good a wedding speech is by the reaction shots of the bride and groom as they listen, and this one was no exception!